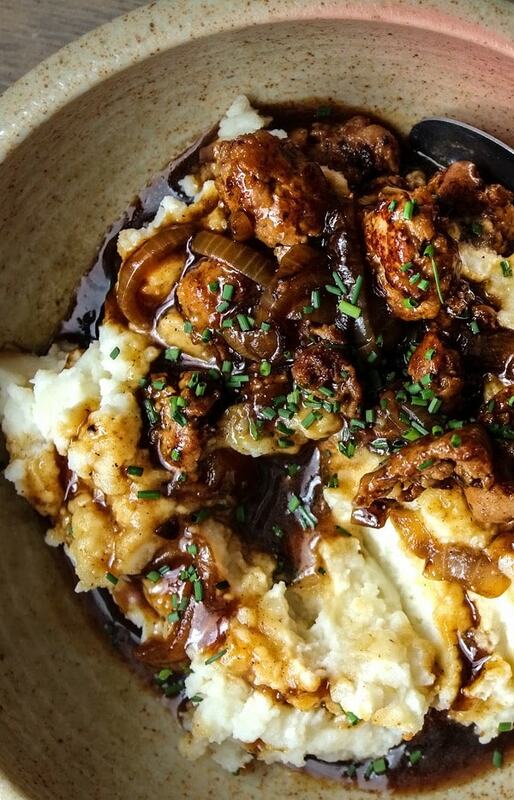 Pan fried sausages smothered in stout and onion gravy on creamy garlic mashed potatoes. It’s a classic comfort food that’s bite sized and easier to enjoy! Comfort foods are wonderful. Although it is summer and it’s too warm out for comfort foods, I often ask – why limit it to cold and dreary days? 🙂 Tasty foods should be had all year round right? 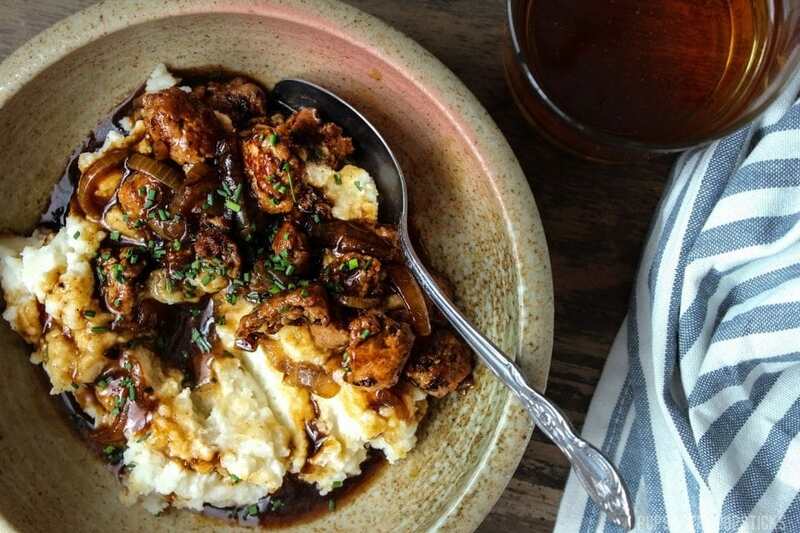 If you never heard of bangers and mash, it is a traditional dish from United Kingdom made of sausages, mashed potatoes and smothered with gravy and it’s absolutely delicious. 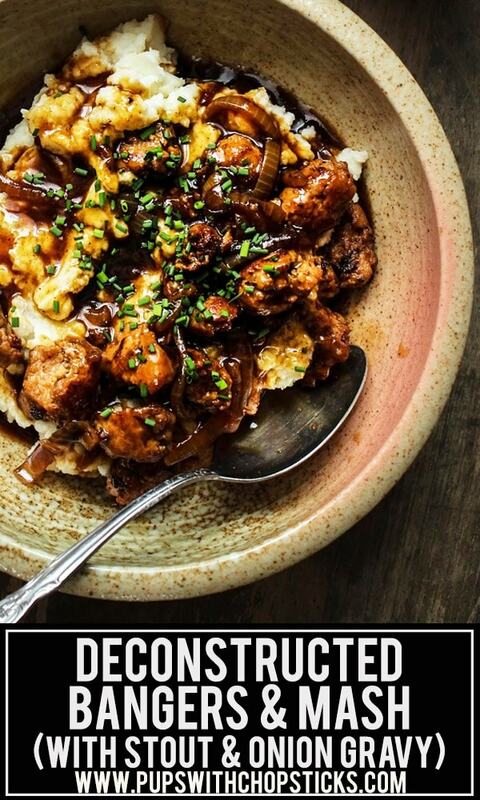 All ingredients for this bangers and mash recipe can be found at your local grocery store. For the mashed potatoes, I used milk however if you want to go the healthier route you substitute this for chicken broth but it will be slightly less creamy. For the sausages, anything goes. Usually, I like to keep it to simple pork sausage. 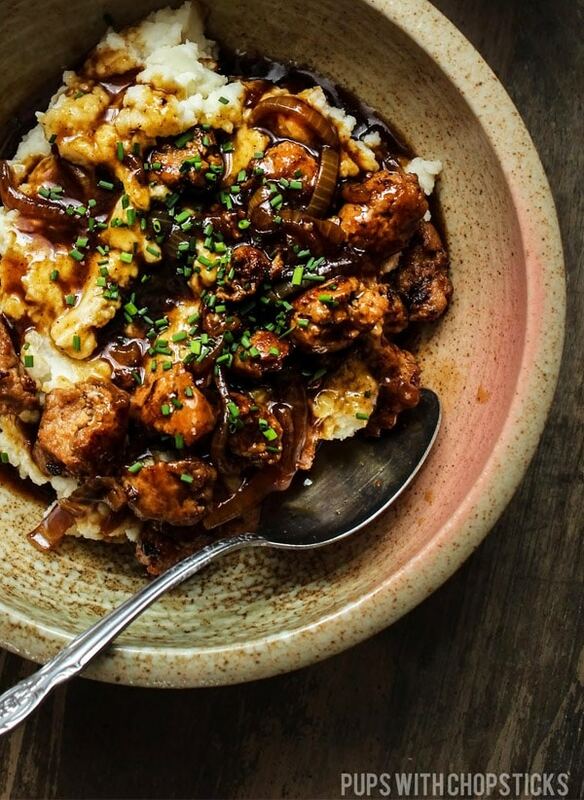 For the gravy, we used a dark beer to give it a bit more flavor. (Stouts, Porters or any dark beer.) However, depending on how dark and strong the beer is, it may give the gravy a bit of a bitter kick. To reduce the bitter kick, we added 1/4 to 1/2 teaspoon of maple syrup. 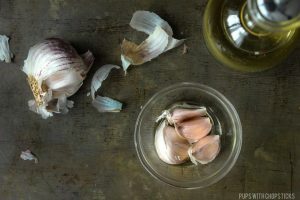 Roast garlic is always something good to have on hand because it’s such a versatile ingredient to have but sometimes when I know I won’t be using any roast garlic for the next week or so it seems wasteful to roast whole garlic bulbs. 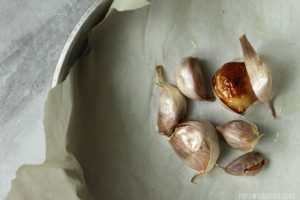 For days where I just need a few roasted garlic cloves, I will only roast the individual bulbs and yes oddly although people never mention it, it actually works! 🙂 It uses the same method of oiling the garlic, but the main difference is you don’t put it in for as long and you need to occasionally check on it so they don’t burn. 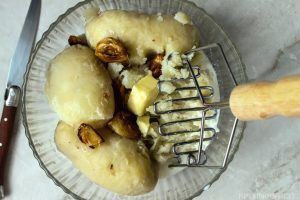 Peeling potatoes is not fun, but there is an easy work way to do it! The trick is to leave the skin on while you are boiling the potatoes. 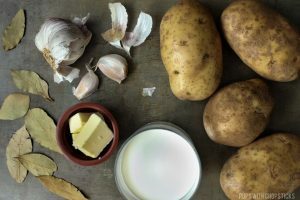 Once the potatoes have finished boiling and you can easily insert a knife into it, bring it over to the sink and drain it and then submerge in cold water. 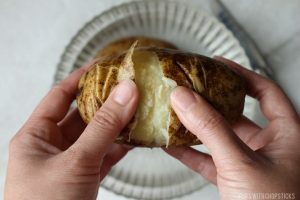 While it is submerged, score around the skin and make a ring around the whole potato and put it back in the cold water and wait for about 5 minutes. Once the potato starts to cool off a bit in the water the skin will peel back easily! Whenever I have bangers and mash is such a cozy dish that I usually don’t like using a fork and knife to cut the sausage whenever I am eating it because I’m usually tucked into blankets or in front of a TV. My utensil of choice is a spoon for this dish, so I like to cut the sausage up into bite-sized pieces. 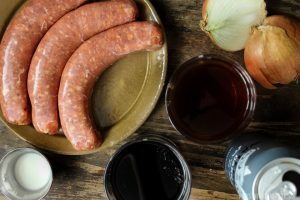 You can cut the sausage into bite-sized pieces as-is, or you can peel off the skin – both work and taste good. Coat the garlic in oil. On a cookie sheet with parchment paper, put the garlic in and roast it. I keep it in for 10 minutes for smaller cloves and 15-20 minutes for larger cloves but check at the 10 minute mark to see if it has browned and soften before adding extra time to it since ovens and garlic sizes vary. You’ll know it’s down when it is golden brown. Once the garlic is cool enough to handle, peel the skins off and remove the hard nubs on the bottom end (Those are not always fun to eat.) and set aside. 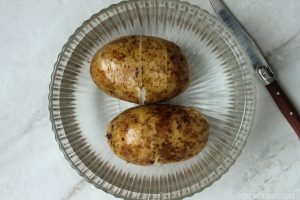 Scrub the potatoes to remove the dirt. When the potatoes are done, drain the water out of the pot. Add salt to taste (not too much, the gravy has salt too! :)) and set the mashed potatoes a side for later. With a sharp knife, make a slit down the sausage and remove the meat and break it up into small pieces. Discard the casing. 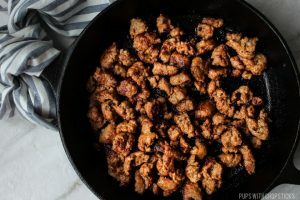 In a large skillet pan, set the stove to medium high heat and cook the sausage for 20 minutes or until cooked through and brown. Once the sausage is done, remove the sausage from the pan and set aside. Leave the drippings in the pan. Add the onions into the pan and set the stove to medium low heat. Cook this down until it is brown and caramelized. It should take about 15 minutes. Add in the beef stock and beer and cook it let it simmer for about 5-10 minutes to allow the flavours to meld. If you are a traditionalist, you don’t need to remove the sausage from the casing. 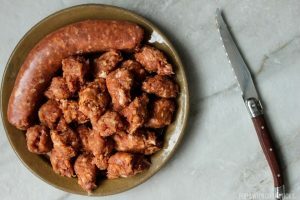 You can pan fry the sausage whole and cut them into small pieces before serving. I just made this last night and it was so good! Quick, easy and a great meal for the start of a Canadian winter. Wow your version looks really good! And your photos are gorgeous! Winter here in the UK, and it has been bitterly cold of late. This is the perfect kind of comfort food you need for supper; tastes wonderful, fills up nicely, and warms the tummy. Just right. Making it a true one utensil dish is such a good idea. Sausages are naughty when it comes to trying to cut with just a fork. Gosh you are so right, you won’t believe how many times I made a mess out of my forked sausages around here! haha I still can’t find half the squirted sausage grease, they fly far! I LOVE this sort of meal — and in your recipe, each of the individual ingredients look so divine. That garlic! Those potatoes! Oh my. And I’m with you, I’ll take a comfort food any season! Garlicky potatoes are my kryptonite! haha! Omgosh Joyce…I CANNOT wait to make this recipe! 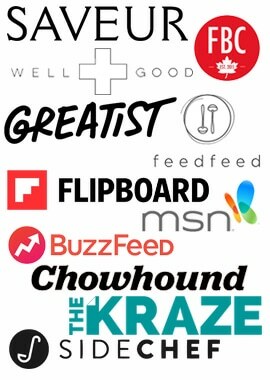 Just bookmarked and, of course, scheduling it to Pinterest. It’s just gorgeous…thanks for sharing! anything deconstructed is fancyyyy in my eyes! 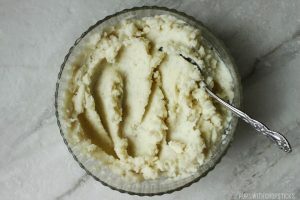 i personally like the texture of russets more than yukon gold/etc in mashed potatoes because i feel like they’re a little less dense, but i also never say no to mashed potatoes (; especially if it has roasted garlic! When I look at this fantastic photo , ingredients are easy to make this dish. Thank you to bring this up, so that I can cook for my family. I am so happy! Hope they enjoy it as much as we do! Yes, this is very to make vegetarian! 🙂 Sometimes I just do it with mushrooms and broccoli! Yessssss! This looks so homey and delicious – perfect for a late night meal or a winter evening! Such a wonderful comfort food! This looks like the perfect version for my kids too. Love your photos. Yes. All the yes. I rarely cook, but your recipes are inspiring me enough to cook more! 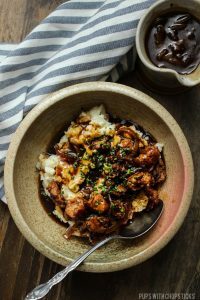 Your Chinese-style Beer Braised Pork Belly was incredible and I definitely want to try this soon. Also, love the bowl! 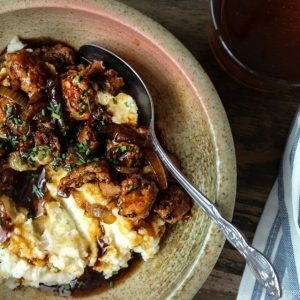 Yes, I’m right there with you on comfort food all year round! 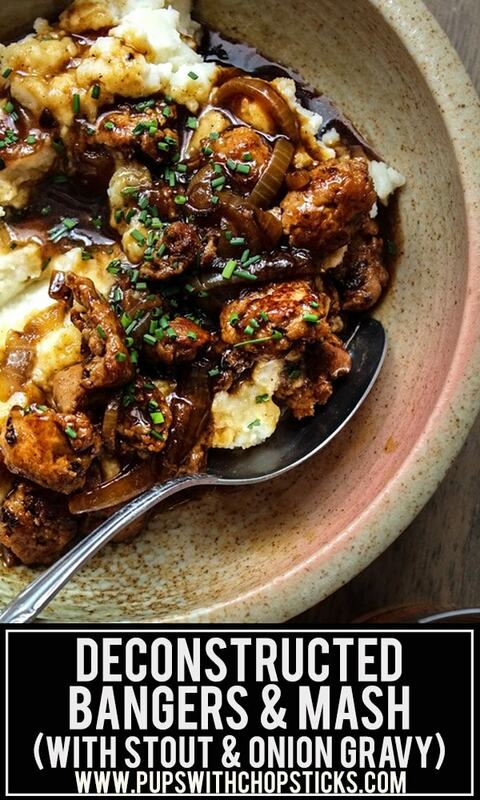 Especially when it’s as comforting as this bangers and mash! Love this easier to eat version you made!